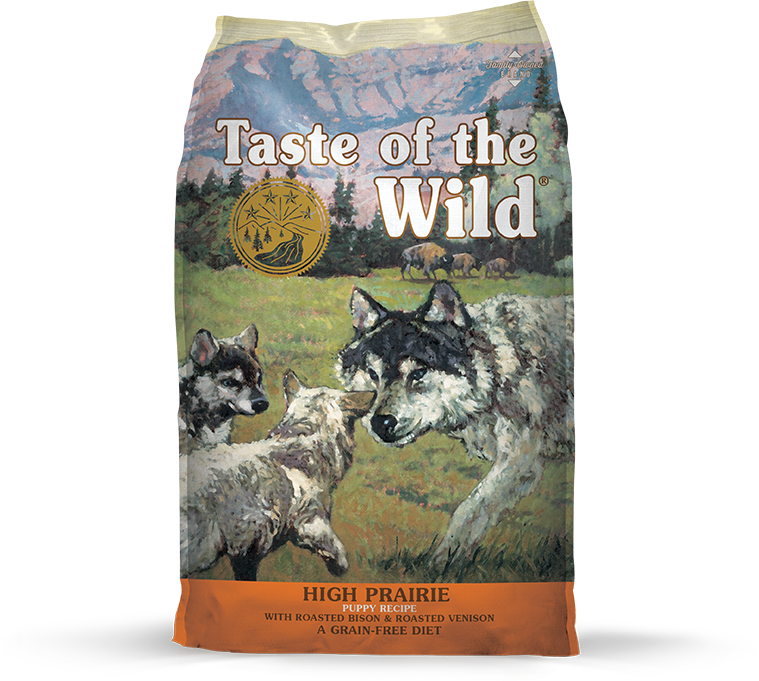 Taste of the Wild High Prairie Puppy Recipe is formulated to meet the nutritional levels established by the AAFCO Dog Food Nutrient Profiles for All Life Stages including growth of large size dogs (70 lbs. or more as an adult). High Prairie Puppy® Formula with Roasted Bison & Roasted Venison is rated 4.8 out of 5 by 94. Rated 5 out of 5 by Mazza3506 from Perfect Pup food We rescued a 4 month old puppy from a hoarding situation. She was horribly under weight, her fur and skin were in bad shape. We have been feeding our other dogs Taste of the Wild for years. We had never used the puppy formula before so we gave it a chance. We were impressed with how quickly our little girls put on weight, thickened her very short coat, and how soft her coat became. Rated 5 out of 5 by Shachafit from Picky and sensitive pup loves it I have a czechoslovakian wolfdog pup, and ever since I brought her she never liked any of the dry foods I tried and always had diarrhea. Following many frustrating months, I contacted a breeder from abroad and she highly recommended feeding my pup with taste of the wild. My pup loves it and the diarrhea stopped almost immediately after she began eating this food, she gained lots of weight and her fur became lovely. Rated 5 out of 5 by Frgragg from Great food for our babies!!! We changed our girls food to Taste of the Wild Puppy and could not be more pleased!!! The food has made our girl look so healthy!! The big surprise is that as most knows a German Shepard sheds a lot of hair but feeding her Taste of Wild has reduced the shedding to a minimum!!! Wow we are so grateful to be able to get this good food for our baby and to see how healthy she looks!!!! Rated 5 out of 5 by Mabel P Stewart from Never been so happy to see my dog eat! Mabel is a 6 month old GSD mix puppy. After being on 3 other puppy foods prior, at the recommendation from a friend, we tried TOTW High Prairie Puppy. Mabel was having some stomach problems, wasn't interested in eating, had started to lose weight because she was vomiting up the food we had her on at the time(and no it wasn't cheap stuff), and also has a sensitivity to chicken. We took her to the vet and had a barium swallow and x-rays done just to be sure there wasn't an obstruction. Everything came back normal. So we bought a bag and after a few days on this food she is excited to eat, dances around her food dish, has more energy, and is back to acting like an energetic puppy! Rated 5 out of 5 by StephanieW from Love the food but confused about ingredient label! My rescue GSD loves the High Prairie food, and it has done wonders for her overall appearance - her coat has thickened and softened so much - and she's so playful and happy. Easy on the tummy, too. She never gets sick eating it. My friend uses the High Prairie puppy formula. My only confusion is over the labeling. If you look at the ingredients and the guaranteed analysis on your WEBSITE, both of them list taurine, which is important for me. Not a lot of dog foods include it. However, when you look at the actual label on the bag, taurine is omitted. Why? Rated 5 out of 5 by ashley13 from My labrador puppy LOVED this food! After having some serious issues with grain inclusive foods, we switched our girl over to this brand and flavor. She absolutely loved it! Her coat was always shiny, her stools were back to normal, and she seemed to grow and develop really well for the first 10 months as well. Unfortunately, she didn't do so well on the other puppy formula, Pacific Stream, as she appeared to hate something about it. She did get bored of this flavor over-time and we switched her over to an All Life Stages wild boar blend. Overall, we loved this food for our pup. Rated 4 out of 5 by Bean from Puppy allergy Our puggle puppy has developed allergies that the vet believes to be food related. We started her on High Prairie Puppy formula bison and venison 4 weeks ago after her diagnosis. She loves the food and we are keeping our fingers crossed that this food will resolve her allergy. The vet said it can take 8 to 12 weeks before we'll know. Just wondering if any of your other customers have gone through a similar experience, any success stories you can share. Hi Kevin, thanks for your question. We recommend you work with your veterinarian to determine the right time to transition your pet. As a general guide, we recommend feeding puppy food until 10-12 months of age. For giant breeds, between 12-18 months of age is a good time to make the transition to adult food. I have a 75 pound pit that just turned 1. I also have a 4 month old pit that is 45 pounds (neither of the dogs are over weight). I have been feeding them the same food but now the male is a year old is the puppy food still ok to feed him? Hi, Nate. This formula will absolutely work for both of your dogs. We recommend you to talk to your veterinarian about the right time to transition your pet. As a general guide, we recommend feeding puppy food until 10-12 months of age. For giant breeds, between 12-18 months of age is a good time to make the transition to adult food. While High Prairie Puppy was developed for growing puppies, it is formulated to meet the nutritional needs for dog of all life stages. I was wondering what the calcium/phosphorus ratio was for this diet. My vet is concerned about the ratio for my large breed puppy. Thanks. Our High Prairie Puppy formula has a calcium to phosphorus ratio of 1.4:1.0 which meets the AAFCO recommendations for large breed puppies. Additionally, all of our all life stages foods were formulated with large breed puppies in mind and contain the correct balance of calcium to phosphorus. For information about additional formulas, please contact a product specialist at http://www.tasteofthewildpetfood.com/#contact-us or call 1-800-342-4808. How many cups are in the 30lb bag? Hello, a 30-pound bag of High Prairie Puppy formula contains approximately 137 cups. Do you have a large breed puppy food? I have two lab puppies. Hi, Steve. Our puppy formulas provide excellent nutrition for puppies of all sizes and breeds. Our High Prairie Puppy formula has special features to help support optimal health and well-being for growing puppies. Hi, Emma and congrats on the new addition to your family! We recommend starting with the feeding guide printed on the side gusset of the bag and making adjustments based on your pup&rsquo;s activity level, body condition and age. It can also be found on our website https://www.tasteofthewildpetfood.com/dog-formulas/high-prairie-puppy-formula-with-bison-roasted-venison/. How often you feed your pup is a matter of personal preference, dogs can be fed less often as they get older. We&rsquo;ve put together a feeding guide below for you to consider. 4 months of age, consider 3&ndash;4 meals per day 4&ndash;6 months of age, consider 2&ndash;3 meals per day 6 months and older, consider two meals per day If you have any questions, please contact us by visiting our website https://www.tasteofthewildpetfood.com/contact-us/. HI, I have purchased this and salmon for my 7mo. puppy but won't eat the puppy version. Only the Adult version which we feed our other dog. Is it okay to feed my puppy adult food if it's the only kind she will eat? Hi, Amy. High Prairie Canine Formula was developed as a maintenance diet and does not provide the nutrition puppies need. We would recommend trying our other puppy formula, Pacific Stream Puppy, or one of our all life stages formulas such as Pine Forest, which is a venison-based formula like High Prairie. Hi, Angel - The meats in Taste of the Wild come from different sources, depending on the type of meat. All of our meats are of the highest quality and the food is processed to precise formula specifications each and every time. We do not use animals from rendering plants or diseased and discarded animals in our formulas - our meat suppliers are USDA inspected and approved. Ingredients used in Taste of the Wild come from the same sources, and are of the same grade and quality as human food. We routinely test and monitor every aspect of the manufacturing process, and work closely with our supply chains to confirm ingredient safety. Our ingredient suppliers are approved through a rigorous process intended to validate commitments to food safety and ingredient quality. You can be assured that we are committed to product safety and quality and adhere to stringent food safety protocols.